We've received a number of questions from participants in the 2011 FIRST Robotics Competition. As part of the challenge, a small robot is required to climb a tall, steel pole as quickly as possible. Naturally, many are looking at neodymium magnets as part of their solution. Here's a quick K&J-style article describing some of the magnetic concepts involved. We hope the advice works well for all the teams using our magnets! Even if you aren't a participant, you might find some of the concepts applicable to your own magnetic projects. Let's break up the problem into 2 parts. Magnet selection can be broken down into two main questions. How strong is the attractive force from a given magnet to the steel pole? Second, how much force is required to securely hold the robot? How much force will a magnet pull towards the pole with? On the product pages of nearly all our magnets, we list Pull Force Case 1 in pounds. That's the measured force required to pull off one magnet stuck to a big, thick steel plate. While that's a great way to compare the strength of two different magnets, it's not what the robots will see on the pole. Why not? For one thing, the pole isn't a big, flat steel plate. It's thin, measuring only 0.065" thick. This means the steel will become saturated and not "hold" all the magnetic flux that a thicker pole would. See our article on the Steel Thickness Calculator for more reading about steel thickness and saturation. Next, the magnet isn't touching the pole. There is some gap between the magnet and the pole. This keeps it from scraping along the pole as it moves. The magnetic attraction of a magnet to a steel object drops very, very quickly with increased distance. Try to place the magnets as close to the pole as possible without touching it. Also, the pole is curved, which means that part of it is farther away from the magnet. To put some actual numbers to this, we considered our BX884 and BX884DCS magnets in the following examples. It is a good magnet for this application, especially if the robot is not too heavy. They're strong, not too wide (and won't overhang away from the pole as much) and can be easily attached with flathead machine screws. For greater strength, they are easily stacked 2 or 3 high. The listed Pull Force Case 1 of this magnet is almost 24 lb. To find the pull force to a flat plate at various distances, use our online Pull Force Calculator. 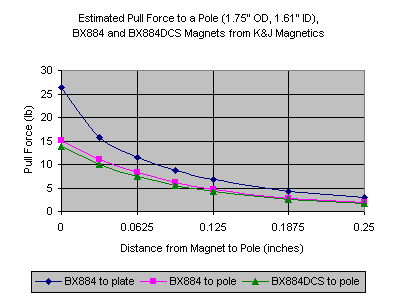 The Calculator results for various magnet-to-pole distances are shown in the graph below as "BX884 to plate." The actual pull force will be less than these values. Using the Steel Thickness Calculator, we learn that one of these magnets stuck to a 0.065" steel plate might provide only 75-80% of the listed pull force. Also, since the pole curves away from the magnet, one might guess that would lose another 10-20% of the strength. Multiplying the Calculator's "BX884 to plate" results by 0.6 - 0.7 is likely to be a good estimate. Some quick FEA simulations confirm this, and produced the magnetic field animation below. How much force is required? OK, we know that a BX884DCS magnet held at about 1/16" away from the pole will pull with about 7 to 8 lb of force. How much force is required to hold up the robot? How much force is required will depend on the details of your robot. The size, mass, geometry, method of contact and propulsion on the pole -- all of these factors matter. For the sake of discussion, we'll consider a simple model as shown at right. Also look at the force diagram at the top of this article. The robot is a box with 4 wheels and one magnet. This probably isn't the exact, best design for the competition, but it offers a simple way to look at magnet selection. We consider two failure modes. In both, we're ignoring the motion and dynamics of a motor propelling this robot up the pole. We're treating it as a statics problem with the brakes on. The first failure mode is Sliding, where the friction between the wheels and the pole isn't strong enough to resist the pull of gravity. The robot slides down the pole. 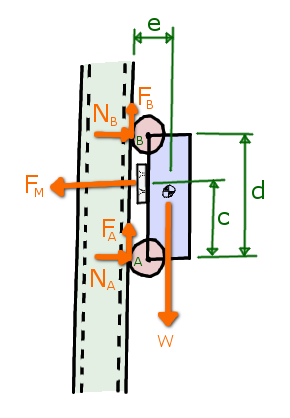 Rotating is the second failure mode, where there is enough friction to prevent sliding. While the bottom wheel doesn't slide, the friction provides a sort of pivot point. The mass of the robot rotates it backwards, away from the pole. You can download this PDF file to see the math we used on this sample problem. We assume that the sum of all the forces in the vertical direction equal zero, so the car doesn't move (with the brakes on). The weight of the car is opposed by the friction of the rubber wheels pressing against it. The stronger your magnet, the stronger this friction force. While it is notoriously difficult to predict friction coefficients, you're likely to need a pull force from the magnet that is at least 1.5 times stronger than the weight of the entire vehicle. If your robot weighs 5 lb, you need at least a 7.5 lb pull from the magnet. To be conservative, aim for 2 times the robot's mass. 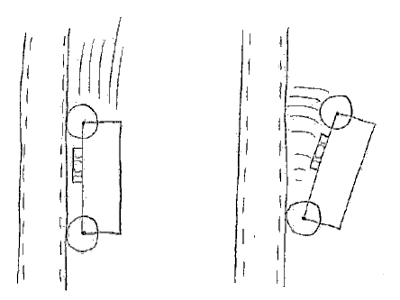 To analyze the rotating condition, we consider the moments (force at a distance, or torque) acting on the vehicle around point A. When just on the edge of staying on the pole, the moment provided by the magnet pulling against the pole is just enough to counter the moment caused by the weight of the robot. In the force diagram at the top of this article, the magnet is trying to rotate the robot counter-clockwise around point A. The weight of the robot is trying to rotate it away from the pole, clockwise. Again, you can find the full details of our analysis in this PDF. The minimum pull from the magnet needs to be at least the mass of the robot mulitplied by the distance e, divided by the distance c. It seems best to place the magnet as close to the top as possible, while also keeping the center of gravity of the robot as close to the pole as you can. Keep in mind that this whole discussion considered finding the minimum downforce required. If you've seen the big airfoils on the back of Indy race cars, you can guess that more downforce is better. You want more force than the absolute minimum. In addition to providing a Factor of Safety, you're likely to be able to race the car to the top quicker without mishap. The math for your design is probably different that what is presented here. Hopefully the methodology described here will be helpful in your own designs. Remember: Prototype, prototype, prototype! The more iterations you can try out, the more likely you are to find a good solution. Leave enough time to experiment with different configurations to find one that works well. If you need some magnet advice, you can contact one of our engineers. You will still have to experiment to get it working well, but we might be able to point you in the right direction. You can attach just about any size magnet to your robot. It all depends on how strong a hold you want or need. We like the idea of using some of our Countersunk Magnets, because they are easy to attach with flathead screws. Below are lists of some good candidates. 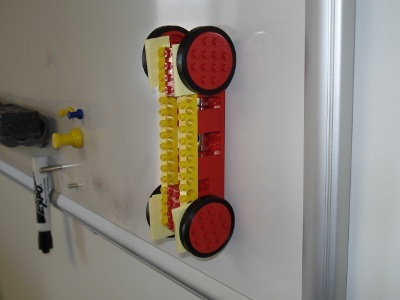 A simple bot made from Lego parts and a single BX884DCS magnet, stuck to a magnetic whiteboard. Details such as controls and motors omitted!